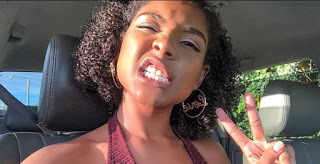 YouTube star Elodie Zone has confirmed her departure from NRG Radio. Elodie has been serving at the radio station as a presenter and digital content manager for about eight months. She takes pride in having hosted the first show on radio, NRGStars, that speaks directly to the content creating community. The vlogger has been hosting NRGStars with fellow vlogger Charlie Karumi since July last year before she decided to step down at the beginning of this year. After much speculation about her conspicuous absence on the airwaves, Elodie Zone finally released a statement yesterday to clear the air. “Though it’s been an awesome and unforgettable experience, I’m sad to let you guys know that I am no longer working at NRG Radio. I chose to step down from the role of a Presenter and Digital Content Manager at the beginning of the year because I decided to pursue other endeavors on this crazy rollercoaster called ‘life” she wrote in part. Elodie explained that she could not discuss her situation at NRG earlier due to some formalities. The influencer, however, did not reveal her next venture, only promising to spring some surprises.